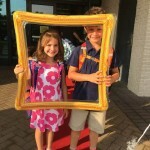 Back in full swing, Hebrew Academy of Tidewater (HAT) kicked off its new year with a back to school Meet and Greet accompanied by a Kona Ice Truck Treat on Monday, August 20. Students were excited to see their friends and new teachers, as were the parents. Working hard to incorporate programs to promote HAT’s tight knit community is the Parent Volunteer Organization. Among the many events planned for the 2018–2019 year are Family Nights, Shabbat Dinner Programs, and a Parents’ Night Out. HAT’s teachers are learning how best to incorporate project-based learning in this year’s plans. This is an approach that encourages students to drive the learning process. In addition, the Hebrew Academy and Strelitz Early Childhood Center has been exploring the process of becoming an International Baccalaureate Primary Years Program which would start with the Strelitz three-year-olds and continue through HAT’s fifth grade. This program’s mission is to develop inquiring, knowledgeable, and caring young people who help to create a better and more peaceful world through understanding and respect. “We were pleased to learn that our approach to education is closely aligned with the IB philosophy,” says Heather Moore, HAT’s Head of School. HAT welcomed back two alumni and their families who moved back to the area. 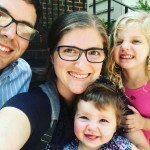 HAT alum Rabbi Yoni Warren was relocated to Norfolk with the Navy, along with his wife Leora and daughters four-year- old Calanit and one-year-old Meirav. The rabbi’s dad, Jay Warren, was HAT’s beloved science teacher for many years. Also, HAT alum Nachama (Sternlicht) Haas relocated from Columbia, S.C. with her husband, Dave, and three children Eitan, Noam, and Yael. Both families say they are excited to have their children at HAT where they spent so many of their formative years. Several teachers joined the HAT faculty this summer. Alicia Pahl-Cornelius teaches the fifth grade general studies class. 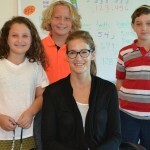 With a master’s of art in teaching from the University of Louisville, Pahl- Cornelius has taught middle school for the past seven years in Kentucky and then at Brandon Middle School in Virginia Beach last year when her family relocated to this area. She became National Board Certified in 2017 and was a 2018 NEA Foundation Global Learning Fellow, which took her to South Africa this summer. 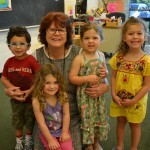 Strelitz added a new three-year-old class this year, and as a result, found an addition to the preschool staff, Judith Warner, as the three-year-old lead teacher. Warner has been in education for many years and holds both a B.S and M.A. in Early Childhood Education. “I am excited to work with such positive people and give my students the opportunity to be curious and engaged in the process of learning,” she says. With so many connections to HAT’s rich history of more than 60 years and looking to an innovative and exciting future ahead, HAT’s administration challenged their community with the question: What is your “BE?” While everyone came up with their own unique description, they agreed that “BE THE FUTURE” reflects their collective investment in the Hebrew Academy and Strelitz Early Childhood Education Center’s community, education, and soul.